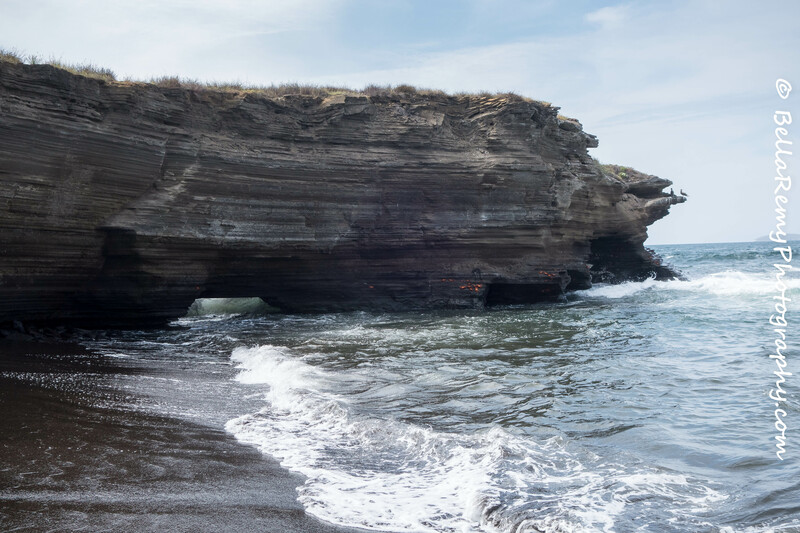 Each island within Galapagos is truly unique in its own way. The cruise lines throughout the islands do their best to maximize time during your visit and offer two stops daily at different locations. Traveling on the Eclipse ship by Ocean Adventures was truly a pleasure. The schedule on the ship was rather rigorous though, and sometimes I wondered if I really was on vacation. At 6:45 a.m., they begin to broadcast music over the ship’s intercom. Then a voice comes on the intercom. Good morning! It is now 6:45 a.m. It is time to….WAKE UP !! Breakfast will be served at 7:00 a.m. This was our daily wake up call, and an elaborate buffet breakfast was served. Departures from the ship for the morning’s excursion was at 8:00 a.m. We would spend about three hours exploring, then return to the ship for refreshment, then lunch served al fresco most days. A siesta time is included while the ship moves to the afternoon’s stop. Santiago Island was the second day’s afternoon excursion and this wet landing was on a black sanded beach. The tide was coming in during the afternoon and the seas were rough while the crew struggled to stabilize the Panga for our unloading. First was an offer to snorkel off the beach. I chose not to snorkel as the waves were rather rough and I really just wanted to capture the surrounding landscape. 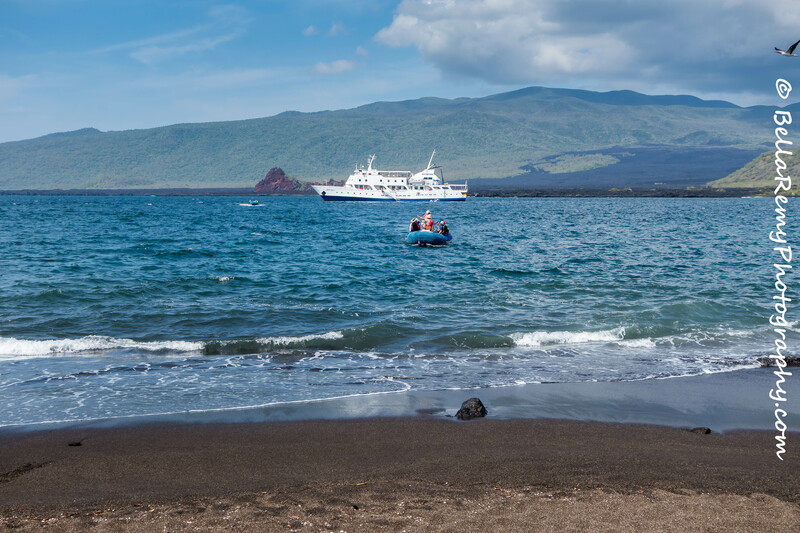 Lounging on the black sanded beach were a number of Galapagos Sea Lions, Marine Iguanas, and Sallylightfoot Crabs. A mother Sea Lion was sleeping while her baby nursed. But you know me, it doesn’t take long for me to discover the birds that may be around. 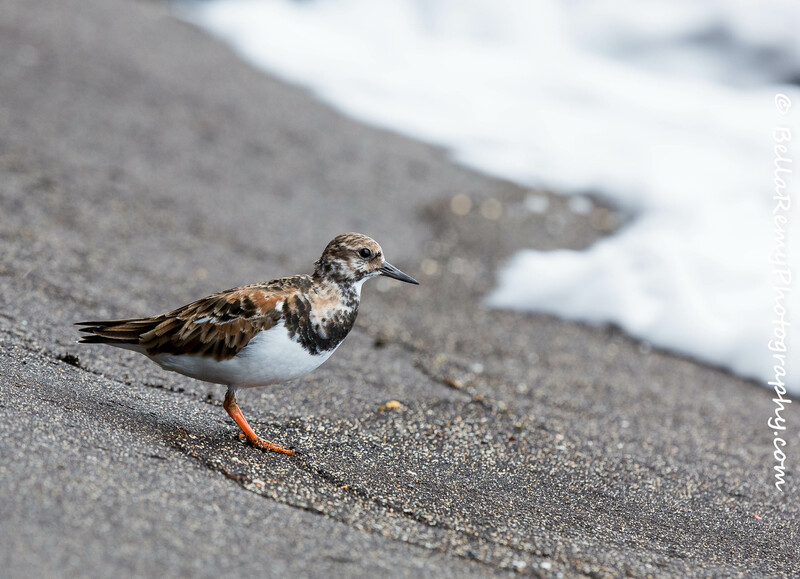 A Galapagos Hawk flew over, a Galapagos Mockingbird flitted by, the Yellow Warblers sang their song in the distance, and this Ruddy Turnstone flew in for a quick visit. This bird can be seen on the east coast of the United States as well, so perhaps he was just traveling through. Or maybe he had been flown off course and decided to stay. 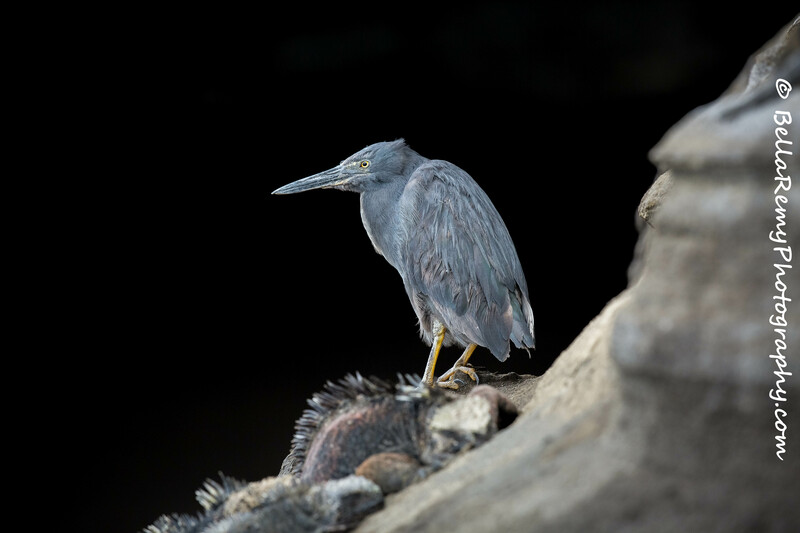 A Lava Heron was quietly standing on the seaside volcanic rock, with Marine Iguanas dozing nearby. But this stop on the beach was only just a teaser for the amount of wildlife that Santiago Island offers. It was truly an Eden filled with wildlife and one of the stops where I took the most images. Birds! Such a one track mind you have. Gosh, what a lovely way to travel. LOL !! Indeed, you might as well call me bird brain. I was the only one on the ship that was really into birds. And yes, it was a fabulous way to travel. Although the cook was way too good and I gained 5 pounds on the trip. Now they won’t come off. Thank you so much for your visit and comment. So glad you liked this post. Aren’t they though? They looked so warm and fuzzy. Can you imagine what he might have seen back then? I’m sure the islands have evolved since then. But still truly amazing. Lovely shots Em. We went to Egypt a few years back and I remember that was a bit of a military campaign…..up at the crack of dawn to visit the next ancient site and then back on board the Nile cruise ship for the afternoon to escape the hottest part of the day. Great experience, but not exactly a relaxing holiday. That’s exactly the plan Mark. I agree, quite a full schedule but heading to an exotic and unique place you would want to see as much as you could see. People would opt out of the excursions and just stay on board. I couldn’t do it. The wildlife is beautiful, but I wouldn’t have enjoyed the early wake-up call and the tight schedule: I prefer to make my one. I love the iguanas and the crabs: that’s an amazing picture. Well done. Indeed, it was a tight schedule but well worth it. Believe me, I took advantage of Siesta time. Thanks Ash ! I particularly like that one too. I am in love with the sea lions and crab images! Those seals are so cool. I love how mom is just chillin on the rocks. The baby’s up close shot you got said to me, “What?” Lol. And the crabs and Iguanas are something out of a cartoon, maybe a children’s counting book. Their colors are further magnified by their numbers. Perhaps the Turnstone knew where you originated from and was saying, “What a small world eh, what’d you get knocked off track?” Lol. Short herons always look so squatty to me! Nice introduction to this island, can’t wait for my next click (after “Post Comment” of course). You’re with me and enjoying the personalities of each of these creatures. Indeed mother nature continues to amaze. Hugs!